DVD to GPhone Converter enables you to take movies from DVD and convert them into small video files playable on GPhone. 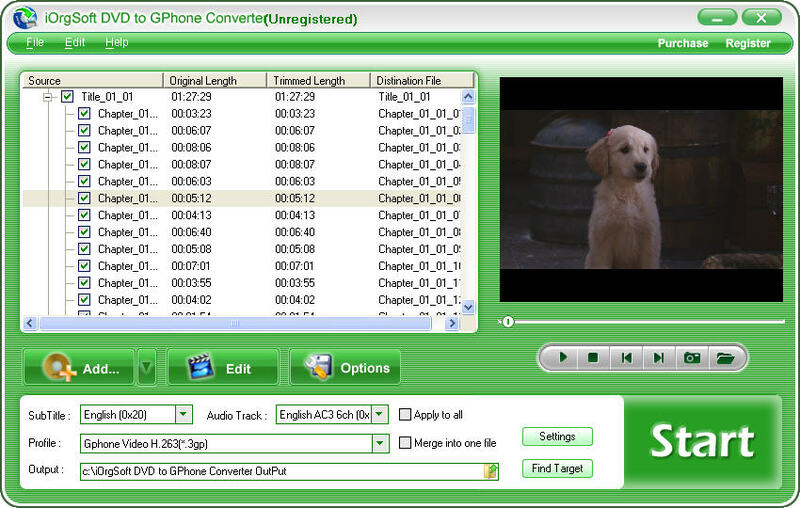 iOrgSoft DVD to GPhone Converter allows you to rip any DVD movies getting rid of region code limitation. iOrgSoft DVD to GPhone Converter can rip DVD to specific MPEG 4, AVC (H.264) MPEG 1, MPEG 2, WMV, AVI, Divx, and Xvid video format with excellent quality. It also allows you to rip DVD audio to MP3, WAV, AAC and AMR format. ...... You can select any favorite part of DVD movie for conversion using 'Trim' function. Oppositely, you can join several DVD chapters or titles into one file provided tick the 'Merge into one file' option. iOrgSoft DVD to GPhone Converter offers other rich options such as DVD video crop, special effect setting, subtitle and audio track selection, etc. Not only a DVD to GPhone Converter, iOrgSoft DVD to GPhone Converter is also a DVD to Audio Converter. With DVD to GPhone Converter, just a few clicks to put your DVD movies on GPhone! Now, download DVD to GPhone Converter, take your favorite DVD movies and music on your GPhone anywhere, entertain your way! * Rip DVD to GPhone video - iOrgSoft DVD to GPhone converter enables you to convert DVD to MPEG 4, AVC (H.264) MPEG 1, MPEG 2, WMV, AVI, Divx, and Xvid video format. Pavtube DVD to Google Phone Converter converts DVD to MP4/3GP/WMV/MP3. best Convert DVD Movies to Gphone software fast converting dvd to gphone format. Qweas is providing links to iOrgSoft DVD to GPhone Converter 2012 as a courtesy, and makes no representations regarding iOrgSoft DVD to GPhone Converter or any other applications or any information related thereto. Any questions, complaints or claims regarding this application iOrgSoft DVD to GPhone Converter 2012 must be directed to the appropriate software vendor. You may click the publisher link of iOrgSoft DVD to GPhone Converter on the top of this page to get more details about the vendor.